In most cases, the sun causes nothing but squinty eyes and dark shadows when used as a background for photographs. But the clever folks at NASA have managed to use celestial objects as the perfect backdrop for photos of supersonic shock waves. 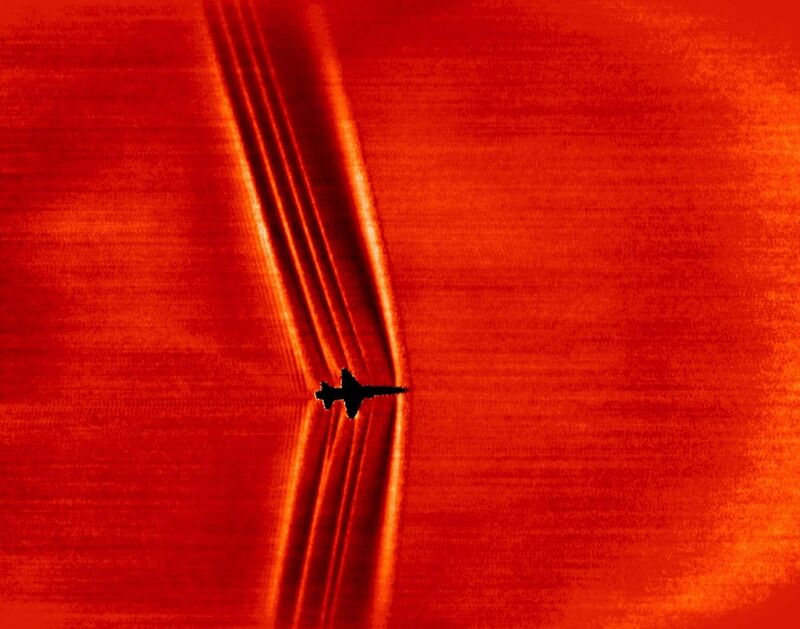 Using a novel photographic technique called Background-Oriented Schlieren using Celestial Objects (or BOSCO), scientists were able to capture shock waves created by a T-38C aircraft, which can fly faster than the speed of sound761.2 mph at sea level. Schlieren photography methods are around 150 years old and originated in Germany, according to NASA. Schlieren, from the German word for "streak," refers to density variations in gases or liquids which are invisible to the naked eye, and the methods have been used to photograph coughs as part of a study on how airborne diseases spread. NASA recently used the technique to photograph shock waves caused by a NASA F-18 jet as it flew faster than the speed of sound above the Mojave Desert in the U.S.
NASA researchers used ground-based cameras and the sun as their backdrop. Photographers used a calcium-K (CaK) optical filter, which shows up sunspots on the sun that are in turn distorted by the supersonic shockwaves and allow for spectacular shots to be taken. The project involved precise coordination between photographers and pilotsthe jets had to hit a specific point in the sky within 300 feet in order to eclipse the sun, while traveling faster than the speed of sound. The photos had to be taken within a two-minute window before the sun's position relative to the Earth changed as our planet continues its orbit of the burning star. The team hope that future research into the aerodynamics of supersonic flight may help in the design of quieter aircraft.